CarGurus has 6,679 nationwide GLS-Class listings starting at $36,900. Mercedes-Benz has been building a full-size GL-Class SUV since 2007. Now, in keeping with a revision in the company’s naming scheme, the GL has become known as the GLS-Class, a marketing move that presents the big GL as the S-Class of SUVs. And while the GLS-Class isn’t based on the actual S-Class sedan, it's still a luxurious and well-appointed vehicle for anyone who wants to drive in comfort and style. Other than the name change, however, the 2017 model represents little more than a refresh of the existing GL. Cosmetic changes include a revised front fascia, a wider grille, a new rear bumper, and LED tail lamps, while tweaks to the interior remain minimal. The biggest mechanical change is the addition of a 9-speed automatic gearbox. The GLS-Class is available in four versions. At the bottom is a diesel version, the GLS350d. The GLS450, meanwhile, features a twin-turbo gasoline V6. This trim is probably the best value and will be the one most buyers choose. 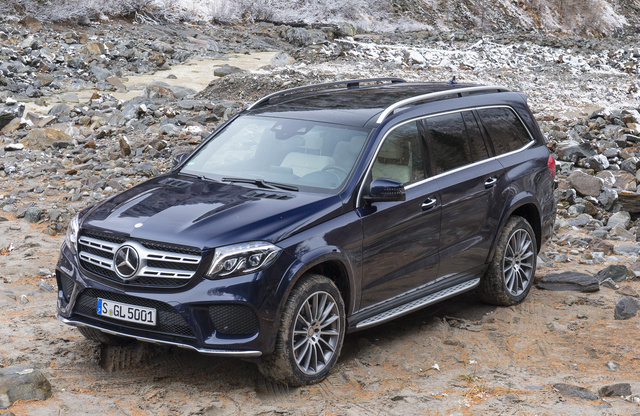 The next step up is the V8-powered GLS550, which also features larger front air intakes and 21-inch AMG wheels. Finally, for speed freaks who still need to haul cargo and sit up high, there is the GLS63 AMG. The biggest competition for the more normal versions of the GLS-Class includes SUVs like the Cadillac Escalade, Infiniti QX80, Lincoln Navigator, and Lexus LX 570. Base versions of the GLS-Class start at under 70 grand, but options and trim packages tend to add up very quickly when you’re buying a Mercedes. The four GLS-Class trims each come with a different engine. The GLS350d gets a 3.0-liter turbodiesel V6, which is good for 255 hp and an ample 457 lb-ft of torque. The GLS450 gets a 3.0-liter twin-turbo V6 with 362 hp and 369 lb-ft of torque. That’s plenty of grunt even for a vehicle that weighs 2.5 tons, but stepping up to the GLS550 gets you a 4.7-liter twin-turbo V8 that makes 449 hp and 516 lb-ft. 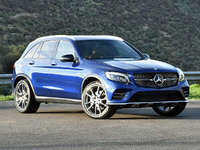 The GLS63 AMG, meanwhile, makes 577 hp and 561 lb-ft of torque, and should do 0-60 mph in less than five seconds. For 2017, all GLS-Class trims other than the AMG come with a 9-speed automatic. The AMG makes do with the beefier AMG Speedshift 7-speed. An Airmatic air suspension comes standard across the GLS lineup, along with Active Curve Control (new for 2017), a system that uses adaptive anti-roll bars at each end to reduce body roll during cornering. The GLS-Class also features Mercedes’ Dynamic Select system, with either five or six driving modes. Since the GLS has plenty of low-end torque, all but one of the driving modes start the vehicle off from second gear. Only the Sport mode starts in first gear, in order to apply the most power possible for a quick start. An Off-Road+ mode is available with an Off-Road Engineering package, raising the vehicle and giving it a fording depth of up to 23.6 inches. While it’s reassuring to know the GLS-Class has some off-road clout, however, the vast majority of them won’t go any further off the beaten path than a gravel driveway. The Dynamic Select system also features an Individual mode that lets the driver tweak the ride using several different settings. On the inside, the GLS-Class is not in the same league of fit and finish as the actual S-Class, but it has all the high-quality materials and premium feel that you’d expect from an automobile with a Mercedes badge. Dominating the dash is an 8-inch infotainment screen with touch controls, though the old rotary knob controller can still be found on the console. There is room for seven people in the GLS-Class, and the third row of seats folds into the floor--no need to pull levers and yank on these seats, as they can be folded electronically via buttons in the cargo area. With the seats folded flat, there’s 93.8 cubic feet of cargo room in the rear. The GLS-Class comes standard with collision warning and autonomous emergency braking, while features like adaptive cruise control, blind-spot assist, and lane-keep assist are optional. The 2017 GLS-Class hasn’t been crash-tested yet, but related Mercedes-Benz models have gotten top results, and Mercedes performs very well on the safety front in general. One other appeal of the GLS-Class is that while it’s a fairly large SUV, it reportedly drives less like a truck than competing models from automakers like Cadillac or Land Rover. But otherwise, it’s standard Mercedes-grade luxury and equipment in a taller, roomier package. What's your take on the 2017 Mercedes-Benz GLS-Class? Have you driven a 2017 Mercedes-Benz GLS-Class? Can the led lights be added to the front Mercedes symbol?